The Lower Deschutes River is a world renowned blue ribbon trout stream. If you are looking to escape the crowds, come enjoy this 6 mile stretch of river located on the Warm Springs Reservation. You will be surrounded by the breathtaking landscape and clouds of stoneflies while fishing for redband trout and the mighty steelhead. Open April 22 – October 31. Open from the locked gate at Dry Creek Campground north (downstream) a distance of approximately 6 miles to the Wasco-Jefferson County line (approximately 1/4 mile downstream of the mouth of Trout Creek). 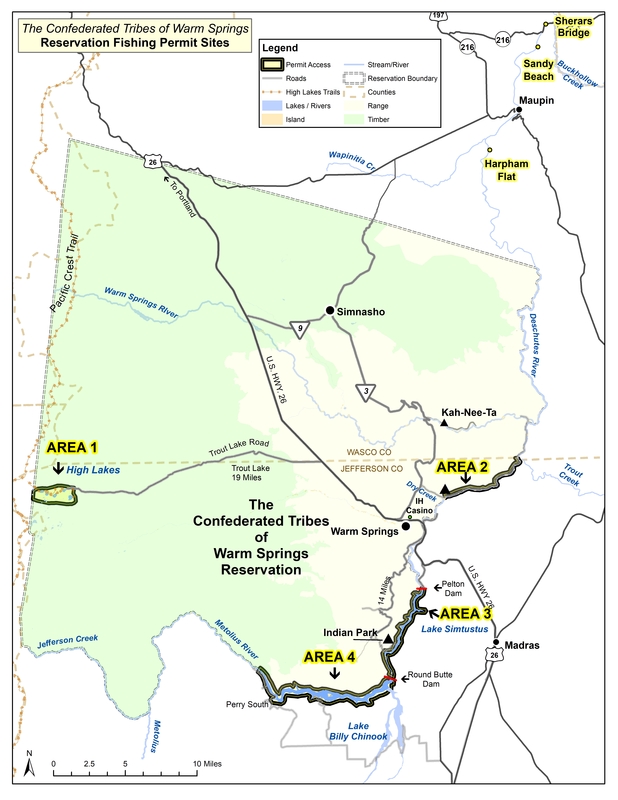 NOTE: A tribal permit is not required to access or fish the east bank of the river in this stretch. (1) Trout: 2 rainbow trout, 10-inch minimum & 13-inch maximum. Restricted to artificial lures or flies. Barbless hooks recommended. (2) Steelhead: 2 hatchery steelhead (Adipose fin clip only). Fishing for steelhead (trout larger than 20 inches) is restricted to the same gear as for trout. (B) Camping allowed at Dry Creek Campground with a fishing permit. (C) All persons must have a permit for Area 2 regardless of age. (D) Camping, fishing and landing on all Reservation Islands is prohibited (all islands west of the middle of the main channel). Launching of boats, rafts, or other floating devices from Reservation land is prohibited on the Deschutes River. (E) Overnight parking of unattended vehicles is prohibited at Dry Creek Campground. (F) Motorbike and ATV riding is prohibited. (G) Camp fires are prohibited at Dry Creek Campground. (H) Only white gas, LP gas, camp stoves, or lanterns permitted. All individuals must have their own permit to access the west bank of the Deschutes River in Area 2, regardless of whether they are fishing or not Permit must be in possession at all times.